Since childhood I have loved flea markets and genealogy. As a genealogist, I have often discovered the lost treasures of other families and purchased them. When I was about twelve years old, I attended a barn sale near Campton, New Hampshire. As the adult collectors pored over the antique farm equipment, I looked through trunks with old photographs and papers. Sitting out on a table was a small metal plaque; at first glance, it appeared to be a silver serving dish. When I picked it up and saw a name and a death date, though, I got curious. I purchased this item for $3.00 and brought it home that summer. I would later learn it was a coffin plate. It was common for the name of the deceased to be inscribed upon a silver plate and secured to his or her coffin. As a remembrance, the coffin plate was often retrieved by the family and saved. This coffin plate sat on my bookshelf at home; for a period it was misplaced. I still live in the same house in Stoughton, and on a shelf in the attic I eventually rediscovered this piece. In the early 1980s I had no quick way of plugging in a name and date to see who this individual was. With so many vital and census records online these days, I recently reinvestigated my purchase from more 30 years ago. As a remembrance, the coffin plate was often retrieved by the family and saved. This coffin plate was once attached to the coffin of Rosella (Whitcomb) Perkins. Rosella was born in either Eden or Hyde Park in Lamoille County, Vermont on 20 March 1820 [calculated from her age at death], a daughter of Asaph and Olive (Buzzell) Whitcomb. She was married in Lamoille County on 2 August 1842 by the Rev. Charles H. Lovejoy to John Burnham Perkins. According to the 1850 census, Rosella and John were living in Elmore, Vermont, where he worked as a dyer. Their household consisted of three small children: Henry (age 6), Thankful (4), and Charles (2). In 1860, this small family had relocated to Fitzwilliam, New Hampshire, and had four children: Asaph W. (named for Rosella’s father), Margaret (8), Jameson D. (5), and Ida R. (1). By 1870, Rosella and her husband were residing in Jaffrey, New Hampshire, without any of their children. Rosella’s story ends back in Elmore, where she died of cancer of the stomach on 24 March 1878, aged 58 years and 4 days. Her widower John died in Elmore in 1883; at his death, he was a clothes cleaner and dyer. My original conclusion was that Rosella was buried in Elmore, where her death was recorded, but I then discovered she was buried in Winchendon, Massachusetts, according to that town’s death record. Since Rosella is not my ancestor, I was faced with a decision on what to do with her coffin plate. I could easily research some of her descendants and offer this back to one of them. But the potential number of living descendants from a marriage in 1842 could be quite large. Who would I choose? Would the coffin plate get lost to time again? Therefore, I made another decision, as many NEHGS members have done since 1845: to add it to the Society’s collection. Since Rosella is not my ancestor, I was faced with a decision on what to do with her coffin plate. There are countless treasures at NEHGS dealing with the mourning of our ancestors. These items include an eighteenth-century post-mortem portrait of an eleven-year-old girl; memorial embroideries; funeral eulogies; and even some other coffin plates. Each document, and each artifact, tells a unique story. 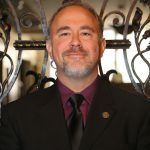 I hope that someday that one of Rosella’s descendants visits NEHGS and see this connection to his or her past – and I know already that my three dollar investment was worthwhile. 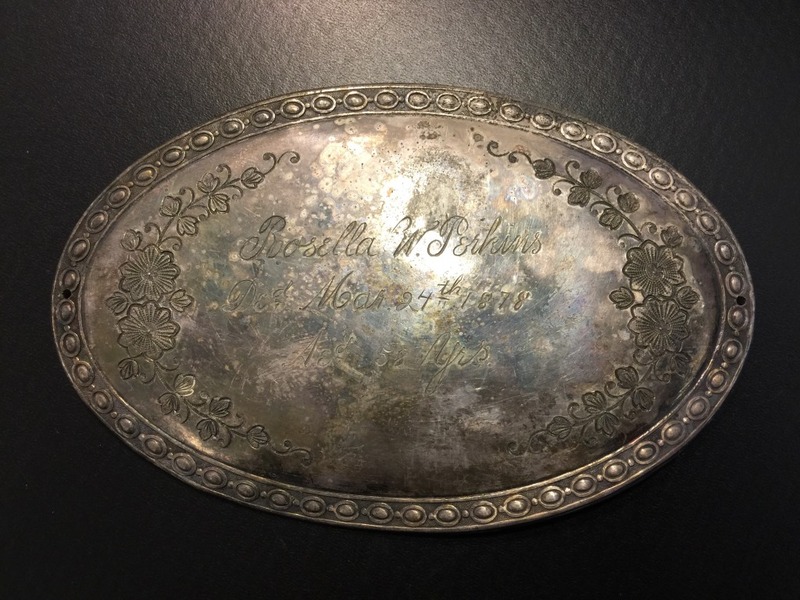 I have the coffin plate of my 3rd great-grandmother, Mary Anne Doak Franklin, who died in 1871 leaving three small children. Her burial place was a mystery until just a few years ago when we located it using an 1873 map of the area that I found online. 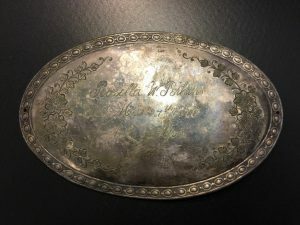 The plate is displayed in a cabinet along with her mother-in-law’s Bible, which recently found its way to me, and her son’s piccolos that he played while marching with the Patriotic Sons of America. All are precious treasures. Was any further research able to determine what happened to all those children? Some had grown & married I suppose but at least the younger ones should have been with the parents? Another mystery to solve – there are so many which makes genealogy so much fun.. I have the coffin plate of my g-g-grandmother Wealthy (Rich) Dow, died 6 May 1855, age 36. She died and was buried in Quincy. After her son John grew up and made a (very) small fortune, he had his mother reburied in Danvers MA. The family story is that, at that time, this old coffin plate was taken off and a new one put on. Some time ago, as a Christmas gift, my husband had it framed (on black velvet). His work associates thought it was macabre in the extreme, but having this object, and its story is precious. I love that her maiden name was Wealthy Rich! Thank you for the intriguing story and for following up on your boyhood interests to the point of researching the piece and the donation. Genealogy becomes real when we find the stories behind names, objects, and photos. Thanks again for your contributions to NE history since your childhood. Yes, thank you for sharing such an interesting story. I knew nothing about coffin plates. We appreciate all the work you do to keep the history alive! The three census records do not match well. Given that the children of the 1850 census do not appear in the 1860 census, I wonder if there are two families with matching parents’ names; alternatively the three children must have died. The 1870 census could match the 1850 one, as no children are mentioned. I thought much the same thing. What happened to the 1850 children, or is 1860 a different family…..
It’s not only coffin plates that announce the death of one’s ancestors. As I write this my family is deciding what to do with very old silver tea pots and accoutrements that date (probably) from at least the 1870s. No one remembers, or was told about to whom they belonged, and now, no one seems to care. The “things” we leave behind might tell a story, but is anyone listening? A wonderful tale that combines Rosella’s history, your genealogical skill, and NEHGS. Well done, David. I am a Buzzell and one of my dad’s cousins was named Olive. Perhaps I am related to Rosella. In situations such as this, and when doing heir searches, I create a tree and then, starting with the censuses, either (1) try to follow the person with the most unusual name or (2) trace all members of the family. Using Step 2, i usually find one person who is easier to trace than the others. If I’m lucky, I’ll locate a “modern” person. The hardest part (being a genealogist) is stopping at this point. You only need one person, hopefully, to be your initial contact.